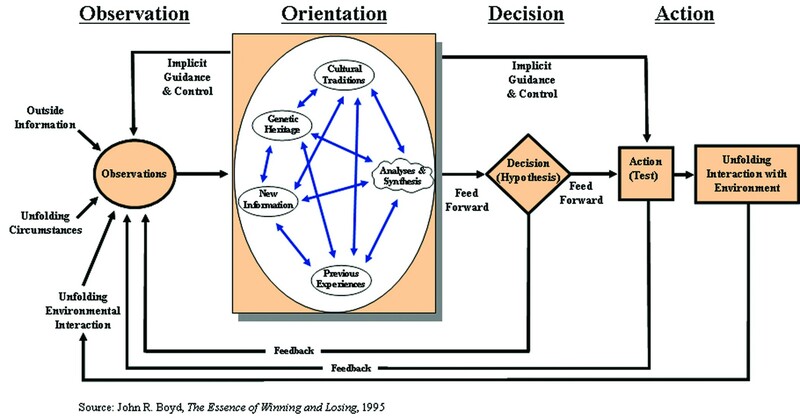 In order to understand Boyd’s model for operations, we must understand his premise that there is a fundamental need for decisions. He states, “Against such a background, actions and decisions become critically important. Actions must be taken over and over again and in many different ways. Decisions must be rendered to monitor and determine the precise nature of the actions needed that will be compatible with the goal. To make these timely decisions implies that we must be able to form mental concepts of observed reality, as we perceive it, and be able to change these concepts as reality itself appears to change. The concepts can then be used as decision-models for improving our capacity for independent action. Such a demand for decisions that literally impact our survival causes one to wonder: How do we generate or create the mental concepts to support this decision-making activity?” [see Boyd, Destruction and Creation]. This quote highlights the basic contribution that Boyd provided. He developed a model that can be extrapolated into a process for decision-making. Boyd called the model he developed the O-O-D-A loop. The O-O-D-A Loop is divided into four sections. Within these four sections we can apply all seven of Boyd’s concepts. The first quarter of the loop is called Observation. Within the observation portion of the loop we find two of Boyd’s principles. Mind-Space-Time = Outside Information: We typically think of our opponents in two dimensions: space (i.e. the market and the environment) and time (i.e. what competitors and customers have done and what actions companies are undertaking in the market). The function of time can also be called forcing functions or compelling events that lead to decision loops. In the process of time, decision events occur and the objective is to win these events in your favor. Boyd expanded this model to include the concept of mind. Mind is the forward-looking element of Boyd’s model. He believed that no effective strategy can be successfully executed without an assumption of what the competitive forces (i.e. companies) are planning to do and how our actions can intercept their planned actions and put them at a disadvantage. An enemy is only defeated in their mind – not in your mind. All of this leads to the process of building a hypothesis of the market evolution and the process of consistently updating and testing the hypothesis. Knowledge of the Strategic Environment = Unfolding Circumstances and Environmental Interaction: Competitive advantage is maintained by being observant and aware of the environment in which operations (i.e. business) are conducted. Andy Grove believed that this was being a member of the cult of the paranoid. Market intelligence is not a one-time event. Market intelligence is a constant activity. To guard against stationarity, strategies and tactics must be updated continuously. Never lose sight of the ultimate objective by allowing tactics and strategies to be governed by a false analysis of the environment and the impact of actions on the outcome. When companies or people disclose information, it is typically the information they want you to know. The more sophisticated competitors seek the information that their competitors do not want them to know. The second quarter of the loop is called Orientation. This portion of the loop is the most misunderstood. Companies go through this portion of the loop, but often do not realize they are doing it. They apply it as a one-time event for a big, important deal, but they do not extend the process to become part of the company’s culture. When companies adopt this strategy for a single big deal, it becomes an internal drag on the company by consuming resources through daily and often endless conference calls. The result is that a company may win a big deal, but the rest of their market coverage suffered. That is not how the process should be applied. Turning the orientation portion of the O-O-D-A loop into a competitive advantage means that companies have developed an internal process and culture to execute through this process without detracting from other functions. Connections and Choices = Cultural, Heritage, New Information and Experiences: The more we know the more we connect to the environment, to the past, to the future, to the people, to ideas and to our competitors. People act on what is familiar, and social and cultural habits are difficult to change. Moral-Mental-Physical = Analyses and Synthesis: Effective strategy works on three levels. The easiest way to lose is to lose the trust that is the basis for social cohesion within and a group, team, company, or army. The third quarter of the loop is called Decision. My experience with big companies has shown that large companies tend to slow the decision making process and are concerned with risk mitigation – rather than the aggressive pursuit of market share. I would submit that the decision making process is an iterative process. It is continuous and the more efficient a company is at executing through the loop, the more valuable the company is to shareholders. That is why the O-O-D-A Loop is a powerful tool for corporate leaders in competitive markets in which exist cycles of creation and destruction. If companies can create a culture of constant decision making that is framed by a discipline process (i.e. O-O-D-A Loop) they create a powerful team that impacts the market leveraging all the internal functions of the company. When I hear VCs say that “large companies cannot innovate” I understand the point they are making – but I do not think they understand the point they are making. The “large companies cannot innovate” is code words for “large companies have a slower decision making process that stifles the act of linking innovation and commercialization with market realities and how decision loops are processed.” Large companies have every advantage over a small company except in one area. Large companies often do not have the desperate internal drive to succeed. Small companies succeed by commercializing innovation. If large companies embraced an internal culture that commercialized innovation – VCs would be out business tomorrow. Embrace Ambiguity = Decision (Hypothesis): We are never sure of the future and we can never have complete and perfect information. We should welcome ambiguity and turn ambiguity to our advantage. We can do this by adapting to our environment and perfecting our ability to deal with incomplete information, thus remaining fluid in our actions. The fourth quarter of the loop is called Action. Within this portion of the loop, there are two functions that are linked. Real target is Your Enemy’s Perception = Action (Test): You must know and understand the enemy’s values and aspirations. The enemy decides when they are defeated – not you. Rapidity, Variety, Harmony, and Initiative = Unfolding Interaction with Environment: One must be able to act in a manner that fosters the ability to survive, prosper, and succeed by shaping the environment where possible to suit your objectives. Rapid decision-making based in near real time is becoming possible through technology. I think the important point to understand is that the objectives of an integrated marketing and sales strategy is to affect the decision making process to suit your objectives. I cannot think of anything more important then winning more decision events in the market! A decision event is when an end-user, whether consumer or corporate entity, makes a decision to spend capital on a product or service. What could be more important then a decision event? Read the book Inside Intel by Tim Jackson pages 192-199. It details Operation Crush in 1980, which was the program name for Intel’s effort to affect the market and win a decisive number of decision events in their favor for the 8086 processor. Entropy: The concept of entropy is adaptable to business and the O-O-D-A Loop. When I think about entropy within a company, I am thinking in Boyd’s terms that “high entropy implies a low potential for doing work, a low capacity for taking action or a high degree of confusion and disorder. Low entropy implies just the opposite.” Companies with a low degree of entropy have the ability to rapidly cycle through the O-O-D-A Loop and have embraced a disciplined process of decision-making. Thus I believe that entropy spans the entire length of the loop and is a measurement of a company’s ability to acquire and conceptualize data into a decision making process that enables a company to run repeated (i.e. hypothesis) tests on the market. I have had multiple experiences through seven companies. As I have aged, I have become far more interested in a company’s decision-making process and leadership culture than product and technology advantages. Companies that execute better (i.e. low entropy) than their competitors often do not have the best product or technology. They have a better internal decision making process that allows them to win more of the decision events in market. When big companies acquire small companies, the decision making process often becomes insulated from market realities through internal politics and bureaucratic processes.